We awoke to our second day of dreary skies today, and even before I opened the drapes I could sense that the day would be chilly. Sure enough, our cold windows promised we would need long sleeves and coats all the warm clothing we all had brought along. Who knew Europe could be this chilly in June? It’s at times like these I’m glad that our cabin has a heated bathroom floor. We must get one of those when we have our own home. When we had received our Viking Daily schedule the night before, I was, to say the least, underwhelmed by today's itinerary. This was our final port on the Main, Wertheim was our only stop for the day, and we would only be in town for about three hours. But why Wertheim am Main? Not having heard of the town before we saw the itinerary, I wasn’t all too sure about how visit-worthy it would be. I did know that Wertheim am Main had castle ruins and was known for Franconian wine and glass making. Sure, we’d had a glass blower on board the night before and yes, I knew that Wertheim is known for its glass. But still. I couldn’t help but wonder if perhaps Viking might have simply chosen it because of its convenient location on the Main Canal. (You know, just so we would have one last stop before the Main flows into the Rhine River?) We still had 156 kilometers to sail until then … I guess this is the best Germany has to offer around here. I'm not proud of my cynicism, but that's what I honestly thought. My doubts about the town grew as I overheard passengers discussing what to do in Wertheim. it sounded like many would skip the included walking tour so they could spend more time browsing and shopping in its many glass shops. Me? I'm not a shopper, but when I learned that the Brothers Grimm had based Snow White on a real local woman, I briefly toyed with dragging Dan into a shop so we could buy a souvenir mirror. Ultimately, curiosity won out and we opted to take the included tour and figure out the rest afterward. After we got back on board, I realized that Wertheim was so picturesque that we completely forgot about visiting any glass shops. As everyone gathered in the lobby, Dewi announced an adjusted Back on Board time. Thanks to lock schedules, a delayed docking, and another lock appointment later that day we'd have to be back at 12:30. So much for the three hours in town. Still, no one seemed to mind. We all understood that river cruise itineraries often have to be adjusted due to unforeseen circumstances. And so off we all went, to make the most of the time we did have. Standing on the tiny triangle of land at the point where the Tauber River joins the Main River. 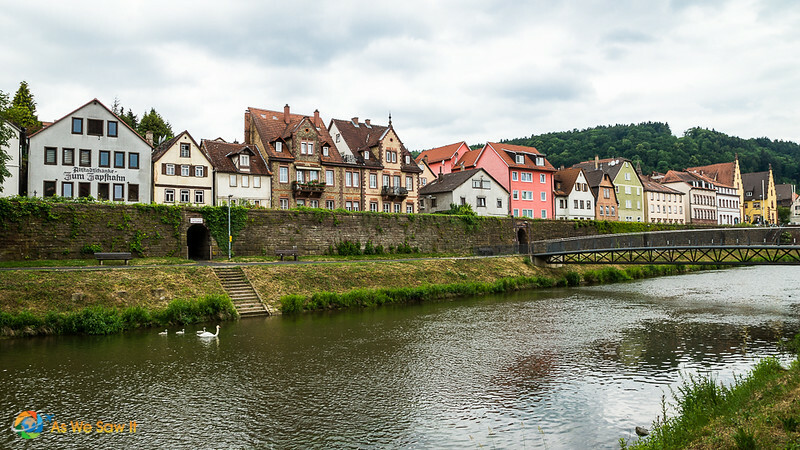 Wertheim's old town sits smack dab on a tiny point of land at the spot where the Tauber River joins the Main River. Captain Oliver couldn’t have docked any closer to the spot if he had tried. I laughed to myself: For sure, the ship will be easy to find on the way back! 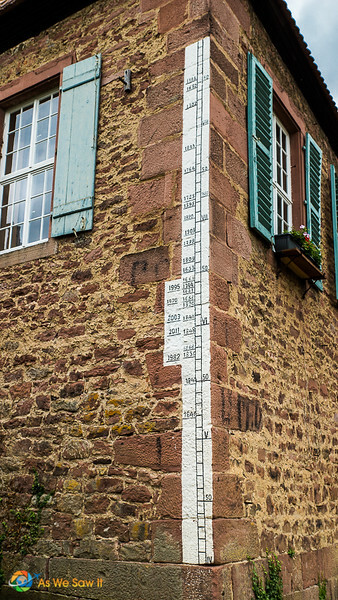 Thanks to the surrounding mountains and the proximity of the two rivers, Wertheim has endured repeated floods. Many of them had risen to nearly apocalyptic proportions. Just as we had seen in Passau, many of the old town structures have markers that show just how high the water has been over the centuries. Our guide took us to one of them. Installed flood gates around the town, which will hold back a small flood. When it reaches a certain height then they open the gates. Otherwise the external water pressure could destroy the town. They also raised the streets 1.5 meters. In many cases what had been the ground floor is now a basement. 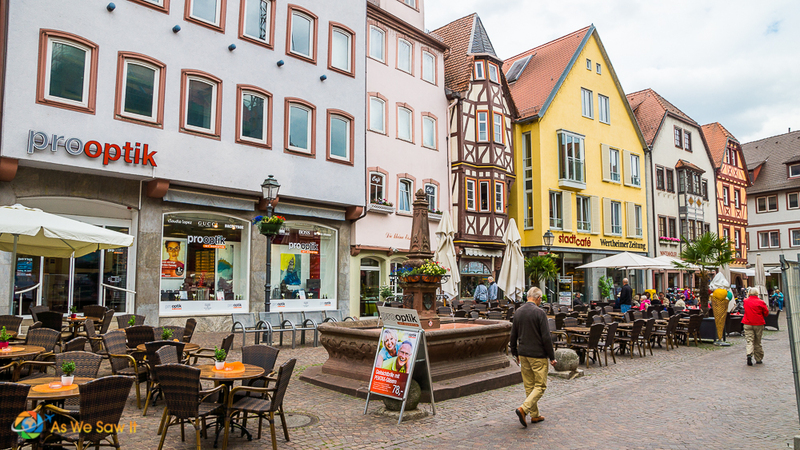 The market square is filled with well-preserved half-timbered buildings, many of which were built in the 16th century. 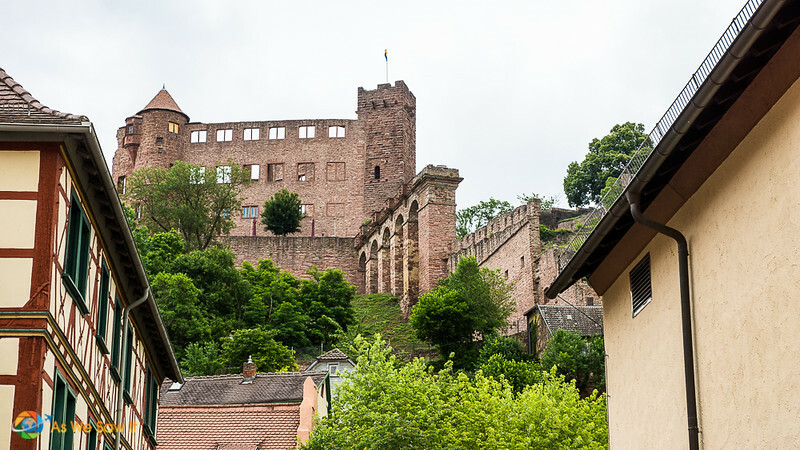 One place that will never experience a flood is the impressive Wertheim Castle (Burg Wertheim), sitting high on the hill overlooking the town. Dating from the 12th century It was owned by the ruling family and repeatedly expanded during the 15th – 17th centuries. The castle fortress was destroyed during the Thirty Years' War, but not by an enemy. A 9-year-old girl fell asleep and forgot to extinguish her candle. A mere fire might have been extinguished, but the residents were storing gunpowder in the castle at the time. 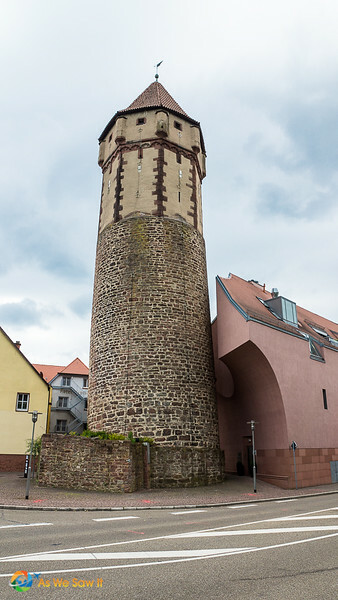 The 13th-century Pointed Tower (Spitzer Turm) might also be called the Leaning Tower of Wertheim; 800 years of flooding having weakened its foundations. Originally built as a lookout tower, it later served as a prison for townspeople who didn’t behave, from drunkards to shrews. Apparently, back in the middle ages bickering women were kept in the tower together until they learned to get along. Wertheim has long been famous for its glass works. The production of glassware and beaded jewelry started in medieval times and continues today with industrial fiberglass and scientific glass. After last night's glass blowing presentation by Hans Ittig a lot of people decided to see what his Wertheim shop had to offer. 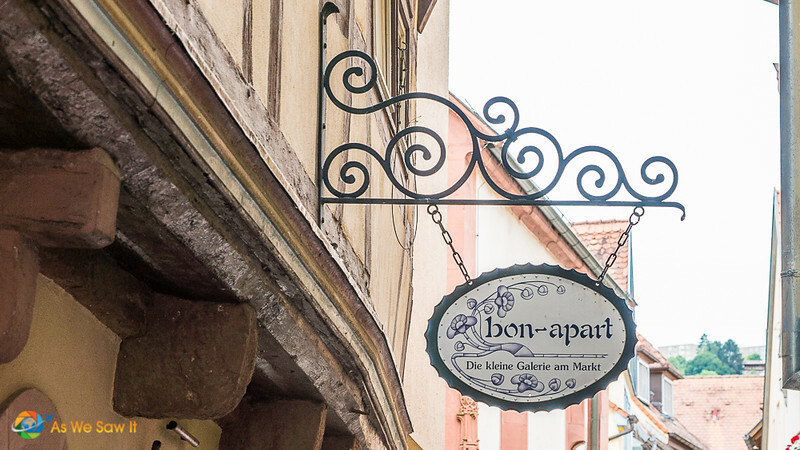 Bon-Apart is an old half-timbered house just off the market square. 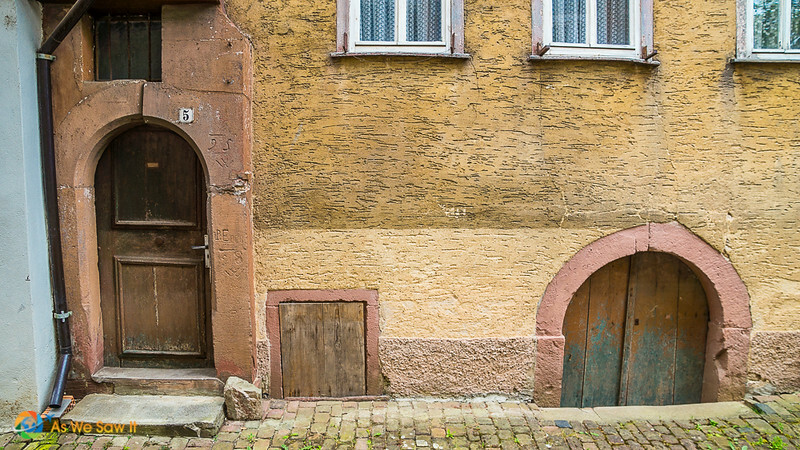 Originally built for a knight named Zobel in 1520, it's a cute place from the outside. We didn't visit any of the town's many glass shops, too busy exploring the streets and enjoying the medieval ambiance, though that afternoon we heard a lot of people discussing the wonderful purchases that would be awaiting them when they got home. As I've mentioned in earlier stories, it's nice to have a balance of tours, free time and on-board activities. Though the afternoon was mostly unplanned, we did have the option to join in a “German teatime” in the lounge at 3:30. This was nothing like a “proper English tea,” believe me. It was a talk about how to prepare Rudesheimer Coffee, and just as when they had shown us how to prepare Apple Strudel, they drafted passengers to participate in the presentation. During the presentation, the staff handed out cups of the spiked coffee so we could try it ourselves. Afterwards, we enjoyed a more cookies and tea on the Aquavit Terrace. After dinner, the passengers gathered in the Lounge for what was billed as a “music quiz” but was more of a music trivia contest. Michael, the ship's pianist, played a short part of a song, and then our Program Director, Dewi, challenged us with a question that had someting to do with the music. Questions ranged from “where did this song take place?” to “What were the artists' first names?” and more. Our group of four (Dan and me, plus two lovely English ladies we had become friends with) got all but two correct … but it wasn't enough to win the prize: a bottle of sparkling wine. Bummer. No serious worries, though. There will be plenty of wine on tomorrow's itinerary. Lodging: Check hotel prices and read reviews on the site we use, Booking.com. For more sightseeing, see our Wertheim photo gallery. Wertheim was wonderful, especially the castle ruins. Magnificent view of the environs, and a “byzantine” series of stairs that went farther and farther up the mountainside. My wife and I took a small street car up to the castle, then she remained on the main level while I explored the upper reaches. If your balance is normal and you like exploring, this castle is a must. Not as big as Marienberg, but with more atmosphere, in my opinion. Thanks for sharing about the castle, Glenn. We missed the opportunity to visit the ruins, partly because we didn’t know about the street car. I hope our readers add the castle to their plans, so they don’t miss out on this gem like we did. Looks like a fun tour! We’ve never done a river cruise but it’s on our bucket list! I hope you get a chance to do it, Jennifer. There’s a lot of competition between cruise companies these days, so you can often find some good deals. By the way, thanks for linking your blog post to #TheWeeklyPostcard. I appreciate the support. Sampling the Rudesheimer coffee was fun, Lyndall. It was pretty good even though we’re not big brandy fans. True, Liz. I can guarantee that we never would have visited Wertheim had it not been for Viking’s itinerary. Love those German towns. I lived in Germany years ago and always had a blast exploring the towns and castles. Looks like a great trip. We had a wonderful time, Bob. You’re right about Germany; the towns and castles are so much fun to explore. Where did you live in Germany?